The oldest core of the collection is in the St. Lucas guild, in which the artists of Antwerp congregated since 1382. The showpieces of the guild were kept in the painters' or art room. Under the impetus of David Teniers, an academy was established in the heart of the St. Lucas guild in 1663. When the guilds were disbanded in 1773, the Academy for Fine Arts became the proprietor of the works from the painters' room. Among others were Abraham Grapheus by Cornelis de Vos, The Holy Family with the Parrot by Peter Paul Rubens and three paintings by Jacob Jordaens that changed owners in this fashion. Paradoxically enough, the following step in the development of the musuem was the deportment of paintings from the Antwerp churches, cloisters and other public buildings to France during the occupation of 1794 until 1796. In 1815, some forty works were brought back, of which 26 paintings ended up in the museum of the academy, amongst which were various works by Rubens. 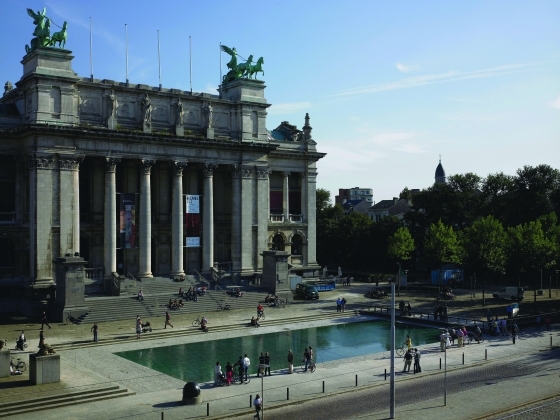 On 5 May 1810, in connection with the church and the cloister of the friar minors in Antwerp, Emperor Napoleon Bonaparte had it decreed: ‘sont mis à la disposition de la ditte ville, pour y placer une école de sessin et un muséee'. Originally there were few means to expand the collections. As that already happened, that was firstly becasue the works contained necessary qualities for the studies of the students. The museum collection served as an examplar for the students. In the early years of its existence the museum managed a collection with more or less 300 pieces. One eighth from the 16th Century, two-thirds from the 17th Century and something more than thirty 18th-century works. In 1841 the collection was enriched in an invaluable way with the Knight Florent van Ertborn's legate. Sir Florent van Ertborn, born in Antwerp in 1784, grew up in an art-loving and wealthy family. In 1817, he became mayor of Antwerp and remained so until 1828 when we was appointed as governor of the Utrecht province. After Belgian Revolution he was asked to come back as mayor, but he remained in Utrecht. Florent van Ertborn died in The Hague on 28 August 1840. He was princely buried as ex-mayor and Maecenas in Antwerp. With his death in 1840, his collection tallied 115 works of art, or 141 panels, with works by Jan van Eyck, Rogier van der Weyden, Hans Memling, Simone Martini, Antonello da Messina and Jean Fouquet, among others. Florent van Ertborn did not follow the taste of his time and collected primarily 14th, 15th and 16th-century art. The talent of Rubens and the realism of the Dutch Golden Century had pushed the art of the previous centuries into obscurity according to him. Among others, he admired the precise drawing and the colour palatte of the gothic painters and he was convinced by them that they also deserved following. Thanks to extensive contacts in the art trade of the time and thanks to his knowledge of collections and collectors, Van Ertborn successfully assembled an exceptional and well-documented collection in a short period of time. From 1841 the collection offered a good balanced overview of what was produced in our region. The 15th and early-16th-century painting, which up to that point was virtually missing, formed a strong basis with 141 pieces and is a fine departure point so that the development of painting in the Low Countries can be studied nearly in full in this museum. Gradually the collection was further filled in. Now, there are more than seven thousand works of art preserved from the 14th Century until more or less the last quarter of the 20th Century. Although the legate remained unsurpassed, the museum has still been able to purchase important 15th-century works in the last 150 years, which stand as a fine supplement for the collection. With regards to this, mention can be made of three panels of a polyptych by Hans Memling and a few works by the Master of Frankfurt. The museum holds two works by Jan van Eyck. Both panels are signed and dated. The Saint Barbara, made in 1437, is different in format, but shows the same special drawing technique of this master. The Madonna at the Fountain is earlier and also makes up part of the collection of Magaretha van Oostenrijk. This devotional piece is brimming with indications of the veneration of the Virgin Mary. , ordered by Christiaan de Hondt, abbot of Ter Duinen. Moreover, it is on this date of this diptych that the painter thanks his eponym. The Seven Sacraments (inv. nr. 393-395) of Rogier van der Weyden, one of the most important works of his career, stands out because Van der Weyden expressively integrates the sacraments and the crucifixion within a church interior. The sacraments are contemporarily presented and within the various scenes there are also portraits made. Van der Weyden is naturally an important portrait painter. Evidence of that is the Diptych of Philippe de Croy (inv. nr. 254), the left side of a diptych from which the other side, with a Madonna, is preserved in The Huntington Art Collections in San Marino. Other portraits are A Tournament Judge, chancellor of the Golden Fleece, and two portraits of Philip the Good, copies after an original by Van der Weyden. The small Portrait of John the Fearless is also exceptional, which is situated in this environment. Other portraits in the KMSKA collection remain anonymous to date, as well as what concerns the presented person as the painter: Portrait of a Monk, Portrait of a Canon. Man with a Roman Coin has already frequently changed identities, but this portrait by Hans Memling is probably depicting someone from the Bembo family. Indications for this can be deduced from the landscape behind and the holly leaf. Christ with Singing and Music-making Angels, purchased in 1895, consists out of three panels that also make part of a polyptych in the church of the Benedictine cloister in the spanish Najéra. The other panels with the ascension to heaven of Mary are not preserved, but the entirety, made around 1489, may have perhaps been one of the largest altar pieces of its time. Two Madonnas originated in the environment of Dieric Bouts and an Adoration of the Shepherds is by the hand of his youngest son Aelbert Bouts, who had a large studio in Leuven and worked further in the path of his father. Madonna with Three Donors lets it be seen that the Master of the (Brugse) Legend of St. Ursula, named after the altarpiece of the Black Sisters in Bruges, is also a talented portrait painter. This diptych, which is still in its original frame, is a fine example of a devotional piece intended for a family altar. In other work, Gerard David tries to reach the wishes of a public and he paints, probably for the free market, images such as The Rest on the Flight into Egypt. Ambrosius Benson, pupil of David, becomes a master in Antwerp and paints Deipara Virgo, or the glorification of the Virgin, a panel that originally was intended for the Rockox family in the Minderbroeder's Church. The Crucifixion and the life of St. Catherine of Alexandria, purchased in 1905, with the St. Barbara on the backside, is the right panel of a triptych by Jan Provoost painted for the Jerusalem Chapel in Bruges. The middle piece, The Crucifixion, is preserved in the Groeninge Museum in Bruges. The left panel, The Dispute of St. Catherine of Alexandria, is kept in the Boijmans van Beuningen Museum in Rotterdam. In addition, there is still a number of notable masters in Brabant that carried the tradition on into the 16th Century. Goswin Van der Weyden is represented by, for example, the Triptych of Antonius Tsgrooten from 1507. At the time the work was ordered for the abbey of Tongerlo and was purchased by the museum in 1966. The polyptych The Seven Sorrows of Mary that the Master of Hoogstraeten made for an altar in the St. Catharine's Church in Hoogstraten, illustrates the great important for the veneration of the seven sorrows around 1500. The Epiphany Triptych by the Master of Frankfurt is inspired by the work of Hugo van der Goes and is along with the The Bearing of the Cross an example of his religios thematic. In addition, there is also secular work by his hand, such as Festival of the Archers. This panel is one of the first great profane pieces that has been preserved and along with the double portrait of The Painter and his Wife, which was purchased in 1974, delivers a surprising image of this exceptional artist. Sometime later than the abovementioned Festival of the Archers, The Members of the Mechelen Guild of the Great Crossbow painted for their meeting hall. It is one of the oldest still-preserved group portraits in our region. The painter has his eponym to thank for that: Master of the Mechelen St. Joris Guild. In the St. Christopher, made around 1490, Quinten Massijs follows the tradition, but in the works which follow he looks towards the future and begins in a new direction.